I have a new cookbook crush and I can’t put it down. I cook from it all the time, and when I’m not cooking from it, I’m thinking about cooking from it. In the spirit of complete disclosure, Pati Jinich and I are friends. She was one of the first food people I met in Washington, when a lovely group of women had a series of lunches. I cooked with her for Charcutepalooza’s Chorizo challenge and love her PBS television show, Pati’s Mexican Kitchen. Pati is a fantastic cook and a terrific teacher; all that comes to life in this gorgeous book. She’s teamed up with Houghton Mifflin Harcourt’s talented editor Rux Martin and the glorious Penny De Los Santos, a food photographer who layers cultural references into every image. The resulting book is approachable and aspirational. It would almost be easier to tell you what I didn’t cook from this book. I jumped right in with the Charred Tomato Salsa, a classic, and moved on to Mango Pico (devoured before it got to the table.) These salsas are key in the multilayered dishes and take just a few moments to make. The chicken tinga is wonderfully piquant and soon to become your go-to for leftover chicken. I adored the Pork Tenderloin in Sweet Citrus Sauce, a quick, straightforward, hands-off preparation that recalls the best pork and orange dishes of the Yucatan, and marries it with the pulled pork of Oaxaca. 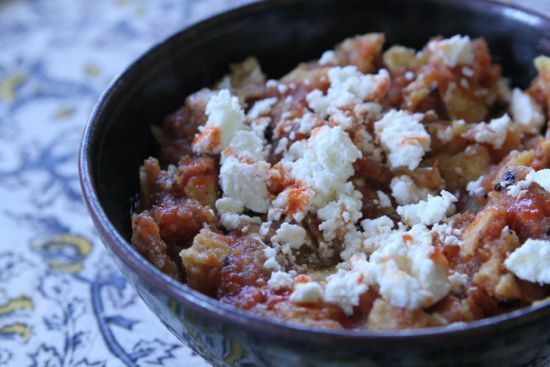 Refried beans and chilaquiles have been two of my favorite Dennis-friendly meals and with Pati’s instructions I’m now serving up simple foods like these with a little something extra – charred tomatoes or fresh serranos or simply using a different technique. My cooking is just that much better with her gentle nudge. 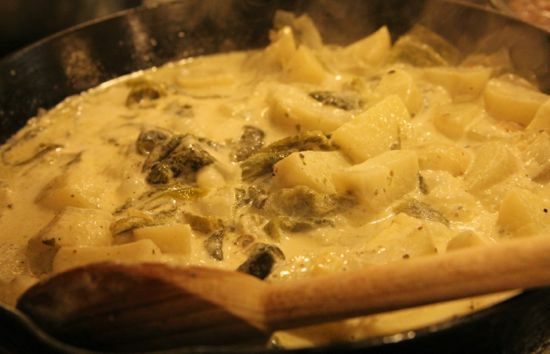 The game changer for me was the recipe for Creamy Poblano Rajas. I’d been dreaming about a breakfast I’d had in Tepoztlan and couldn’t quite figure it out. I knew the women who made it called the dish rajas, and I found canned rajas in the grocery store, but Pati’s recipe helped me find nirvana rajas. These are glorious! Velvety and bright and spicy enough so you want to eat more to keep the tingle alive. The breakfast I had in Mexico included chunks of boiled potatoes, which I recommend. Have hot corn tortillas available. You won’t want a single morsel abandoned. Thank you, Pati, for your beautiful new book. It’s already found a home in my kitchen. And thank you for allowing me to reprint your recipe. 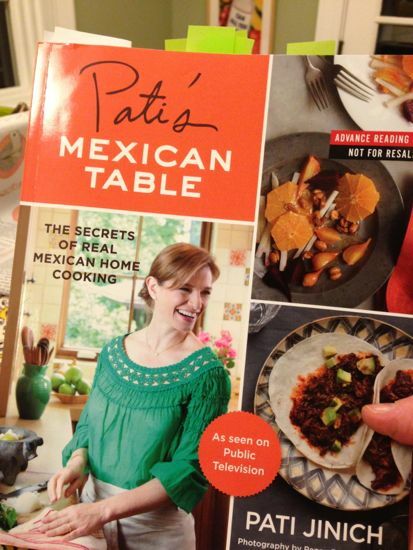 Excerpted from Pati’s Mexican Table © 2013 by Pati Jinich. The word rajas refers to strips of chiles, and some of the most popular are made with poblano chiles, which are charred, sweated, and peeled. Some cooks finish them by adding cooked onions, others add tomatoes or even corn. My preferred version is admittedly decadent. I gently cook onions in butter until all their sweetness has been coaxed out, then mix them into the poblanos along with cream and salty cheese. Serve as a topping for Blissful Corn Torte or as a side to grilled meats or seafood, or spoon into warm corn tortillas for some of the tastiest tacos you will ever have. 1. Heat the butter in a large skillet over medium-low heat until melted and foamy. Add the onions and cook, stirring occasionally, until soft, translucent, and starting to gently brown around the edges, about 15 minutes. 2. Increase the heat to medium-high and add the poblano chile strips. Sprinkle with the salt and pepper and cook for 2 to 3 minutes, until the chiles have lightly browned. Reduce the heat to medium, add the cream and cheese, and cook, tossing gently, until the sauce thickens, 5 to 6 minutes. Serve hot. Poblano chiles are rarely used raw in Mexican cooking. They are usually charred and peeled to bring out their best qualities. The process is simple, and you can make more than you need and freeze them for up to 6 months. CHAR OR BROIL THEM Place the chiles under the broiler, on a hot comal, in a dry skillet set over medium heat, or on an outdoor grill directly over an open flame, which is how they are typically done in Mexico. I prefer to broil them because you can do several at a time. Whatever method you choose, roast, turning them every 2 to 3 minutes, for 6 to 9 minutes. They should be charred and blistered on the outside, and the flesh should be cooked, not burnt—much like roasting marshmallows over a fire. MAKE THEM SWEAT Place the chiles in a plastic bag or a bowl. Seal the bag or cover the bowl tightly with plastic wrap and allow the chiles to sweat for 10 to 20 minutes. When I was growing up, my mom always wrapped the plastic bag in a kitchen towel; I do the same. PEEL AND RINSE Holding each chile under a thin stream of cold running water, remove the charred skin with your fingers. Then make a slit down one side of the pepper and remove the cluster of seeds and veins. If you are using the peppers for stuffing, leave the stems intact. If using them in other dishes, remove the stems and slice the chiles. Note: Poblano chiles vary a great deal in their level of heat. If you don’t want to take any chances, you can tame them. Once the chiles are charred, peeled, and cleaned, soak them in warm water mixed with a tablespoon of brown sugar for 10 to 30 minutes, then drain. Love Pati. Love love love. Please don’t take this wrong..This woman is a great cook and has a lovely personality. . but she speaks to the audience as if she were speaking to children. I tried to look past this but it really is annoying. She is the o nly person on any cooking show to speak in such a child like voice to the audience and as though they were children. What a beautiful review! You know, I don’t think I own a single Mexican cookbook?! I must have this one. MUST. Heading to Amazon to order now. Terrific post, Cathy! I love it when Pati is a guest on Splendid Table! She is so knowledgeable and passionate. One of the things I so love about following the bloggers that I do is getting introduced to new people, books and unexpected things. The items you made from Pati’s book sound like a sunset feels to me- memorably delicious. Look forward to checking her and the book out! Oh this sounds so delicious–and thanks for the tip to tame chilies! My daughter doesn’t like hot and spicy as much as the rest of us, and I don’t like to cook multiple meals, so this trick will work well. I also love that I can freeze charred chilies, so I can put up the summer’s CSA farm share poblano bounty and use throughout the year. I try never to miss Pati’s Mexican Kitchen. Here web site is great too. I found a salad there that I have been taking to all kinds of events for two years now!! It is so great. I hope it is in her book so you can try it. It is called Avocado & Hearts of Palm Chop Chop Salad. Never any leftovers! I’m LOVING the book! So many dishes I want to make! I rediscovered PBS cooking shows somewhat recently, and though I don’t watch too much television, I really enjoy Patti’s show! She seems genuinely excited about her culture and presents her food in such a tangible way. I’m really looking forward to checking out her book! I am with Winnie – no Mexican cookbooks. Between what you described and what Carol has posted, I am convinced. And now that my hubby is eating meat again, the sky’s the limit in my kitchen! Have a happy happy delicious Passover Cathy! OOh NOOO ! I just went to Amazon .com and found this to be “currently unavailable. Do not know when or if it will be available again” AUGH…. I am going on a net search now. If anyone has any ideas please help.